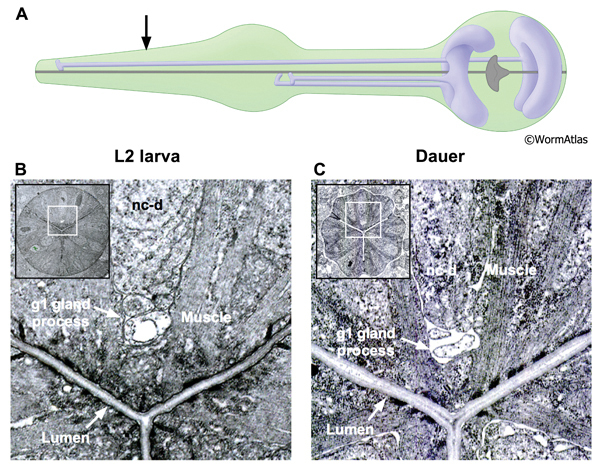 A defining feature of the C. elegans dauer larva is the remodeled pharynx. Feeding ceases during dauer arrest and the pharynx undergoes radial shrinkage, producing a slimmed-down appearance (DPhaFIG 1). In the dauer, several cell types within the pharynx appear shrunken, suggesting loss of cytoplasmic contents. Shrinkage affects all regions of the pharynx and is especially evident in pharyngeal epithelial, marginal, muscle and gland cells. 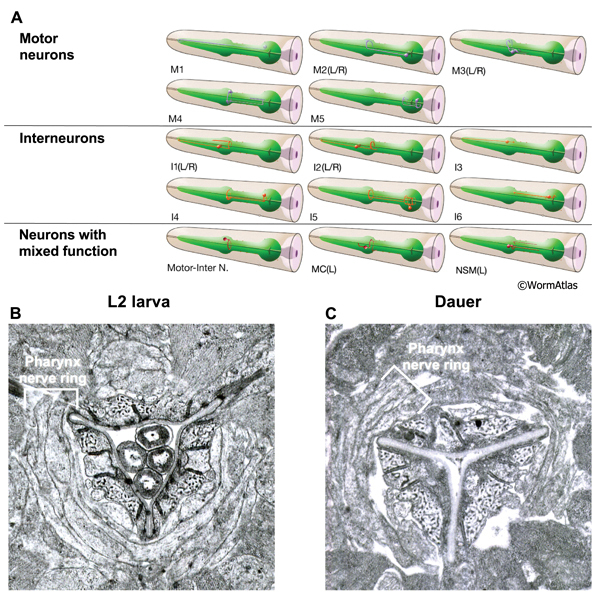 In contrast, neuronal structures within the pharynx are not significantly altered between the dauer and reproductive life stages. Two theories have been proposed for the mechanism of cell shrinkage. First, cell shrinkage may occur as a result of water loss from cells of the pharynx. In support of this, density gradient analysis showed that dauer larvae have increased specific gravity (Cassada and Russell, 1975). Loss of light components, such as water or lipid, from cells could account for this increase in specific gravity. An alternative mechanism for pharyngeal shrinkage is autophagy, which is a process for engulfing and digesting used cellular components, including whole organelles. Autophagy is required for completion of dauer morphogenesis (Melendez et al., 2003). Disruption of autophagic processes during dauer morphogenesis resulted in incomplete radial constriction of the pharynx. A third possibility is that both mechanisms play a role in dauer morphogenesis. Dauer larvae are adapted to survive for many months in harsh environments lacking food and water. A plug formed from body wall cuticle seals the opening to the buccal cavity. This plug prevents toxins from entering the body and helps retain solutes and fluids within the body. In addition, the dauer pharynx does not pump, although some stimuli can trigger a brief period of pumping. Pumping cessation may maintain energy reserves by avoiding unnecessary muscle contraction. Pumping cessation may also protect the pharyngeal muscles from damage during dauer diapause, as was observed for non-pumping adult animals over the adult lifespan (Chow et al., 2006). Mechanisms responsible for pharyngeal pumping cessation in the dauer have not been clearly defined. Exogenous serotonin can stimulate fast pumping rates in dauers, up to 75 pumps/minute, showing that the dauer pharynx is physiologically able to pump fast (Keane and Avery, 2003). Pumping cessation in the dauer might reflect alterations in cholinergic neurotransmission or other aspects of pharyngeal electrophysiology. Dauer recovery is initiated by transfer onto a fresh food source. Pharyngeal pumping represents the first sign of dauer recovery. Resumption of pharyngeal pumping in recovering dauers correlates with recovery of the chemotactic response to the attractants E. coli bacteria and sodium ions (Albert and Riddle, 1983). Recovery of chemotactic responsiveness was proposed to reflect opening of the buccal plug and resumption of feeding. Within a population of recovering dauers, pharyngeal pumping resumes with variable timing. Pumping can resume after as little as 20 minutes on food or take as long as 4 hours (Cassada and Russell, 1975). On average, pumping begins 2-3 hours after transfer onto food (Golden and Riddle, 1984). Although dauer recovery is initiated by food sensing, food need not be continuously present for recovery to proceed. Dauers completed recovery to the L4 stage if transferred away from food after 1 hour or more (Golden and Riddle, 1984). During the first 14 hours of recovery, until the post-recovery molt, pumping dauers swelled to the normal larval diameter without an increase in length (Cassada and Russell, 1975). Thus, pharyngeal pumping may aid rehydration and clearance of the buccal plug when recovery begins. In non-dauers, the tip of the nose is protected by a layer of body wall cuticle which lays over the anterior edges of the h1 and h2 hypodermal cells. The buccal cavity can be divided into four regions based on the cell-type responsible for producing the cuticle layer within each region (Wright and Thomson, 1981). These regions are named the cheilostom, prostom, mesostom and telostom. At the anterior, the cheilostom cuticle is continuous with the body wall cuticle and has also been termed the “bridging cuticle” (Altun and Hall, 2009). The prostom cuticle is produced by the anterior and posterior arcade cells which form two stacked rings encircling the prostom region. The anterior edge of the prostom cuticle extends slightly away from the anterior arcade cells to overlie the posterior edge of the cheilostom cuticle. Next, the mesostom cuticle is produced by the pharyngeal epithelial cells. Finally, the telostom cuticle is produced by the pharyngeal muscles. Three flaps arise at the anterior of the telostom cuticle where it meets the mesostom cuticle (DPhaFIG 2A & InterFIG 1). In dauers, the pharynx is closed by a thick layer of body wall cuticle which folds over the buccal opening to form a plug (DCutFIGs 2B, 4, 5 and 6). In addition, a layer of body wall cuticle projects posteriorly along the buccal lumen, inserting between h1 and the prostom cuticle. This bridging cuticle (Altun and Hall, 2009), appears to compress an anterior projection of the anterior arcade cell over prostom cuticle. One feature of pharyngeal cuticle maturation, which is not altered during dauer diapause, is growth of the mesostomal flaps. 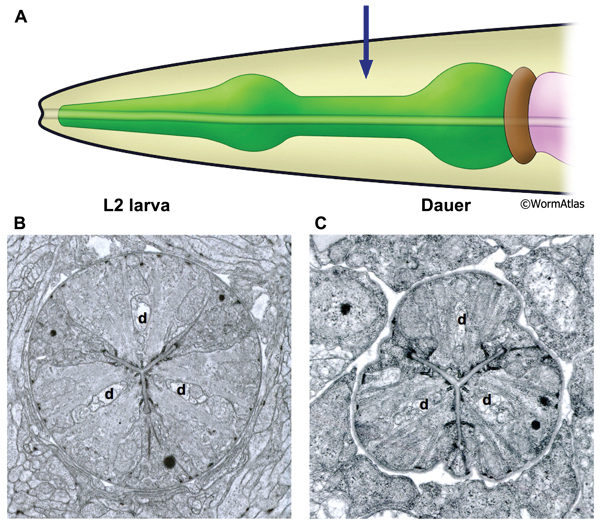 The metastomal flaps of both the dauer and L3 larvae are larger and protrude further into the buccal lumen in the vicinity of the pm1 muscles than in the L2 stage. In dauers, the enlarged mesostomal flaps might function to restrict the gauge of the passageway between the buccal chamber and the pharyngeal lumen (see InterFIG 1 and PhaFIG 5). As animals develop to adulthood, the mesostomal flaps continue to grow, resulting in the large flaps apparent in the adult (DPhaFIG 2). The arcade cells in nondauers encircle the buccal cavity cuticle ahead of the pharyngeal epithelium (Hermaphrodite Interfacial Cells). In cross section, the arcade cells have a dynamic cellular structure with many finger-like invaginations into the surrounding tissue (InterFIG 4). 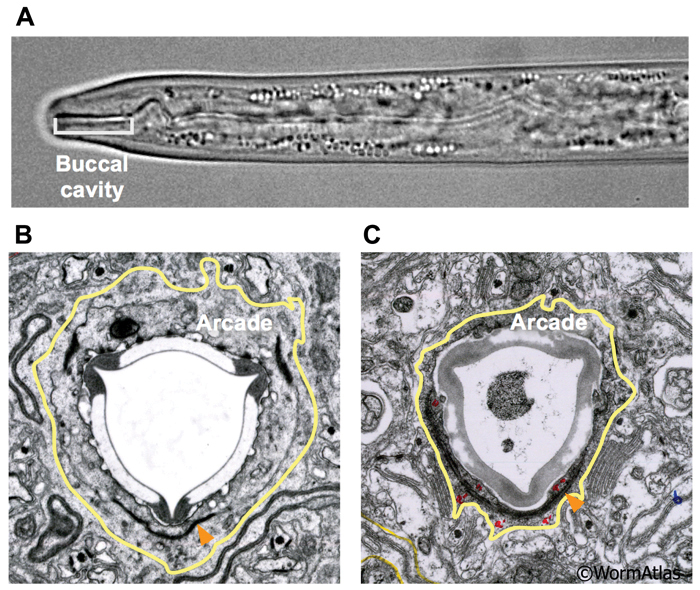 In contrast, arcade cells of dauer larvae appear compressed and shrunken without extensive invagination (DPhaFIG 3). The pharyngeal epithelium lines the posterior region of the buccal cavity, where it joins the pharyngeal lumen. This epithelium is formed by three sets of epithelial cells, named e1, e2 and e3. The e1, e2 and e3 cell bodies are located posteriorly over the pharyngeal muscles and each extends a thin projection anteriorly before swelling to form an interlocked cylinder encasing the buccal cavity in six-fold symmetry (PhaFIG 5). The e1 cell projects anteriorly of the e3 cell, while e2 cells interdigitate between the sets of e1 and e3 cells. This produces a stacked-ring structure. A thick basal lamina surrounds the edge of the cylindrical pharyngeal epithelium, facing the accessory pseudocoelom. Adherens junctions connect the epithelial cells with each other at their lateral borders. The epithelial cells contain intermediate filaments oriented radially, between the apical membrane at the pharyngeal lumen and the basal lamina. 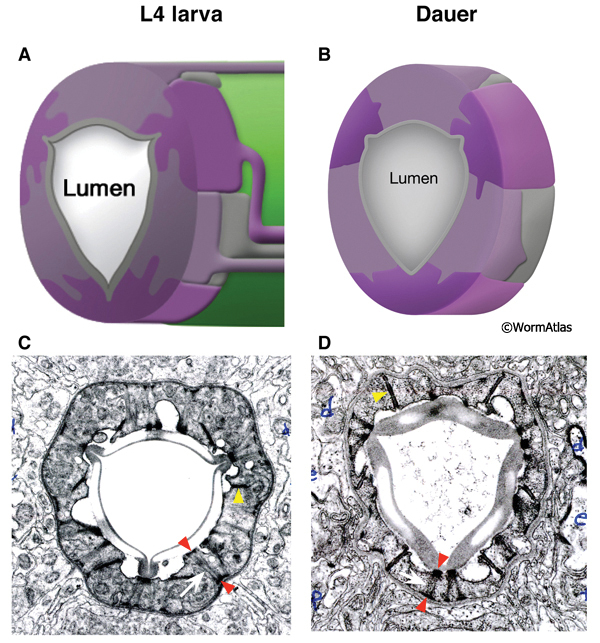 Hemi-desmosomes anchor the intermediate filaments to the plasma membrane on each end of the filaments. In dauers, the pharyngeal epithelium maintains the same overall structure as described for non-dauers. However, the pharyngeal epithelium appears noticeably shrunken in dauers (DPhaFIG 4). This shrunken appearance is reminiscent of the arcade cell morphology in dauers. In addition, the adherens junctions between neighboring epithelial cells appear longer, possibly strengthening the barrier between the internal environment of the body and the buccal cavity. The lateral edges of the dauer pharyngeal epithelium are shorter and less extensively interlocked than in non-dauers. Eight sets of pharyngeal muscles (pm1-pm8), totaling 34 muscle cells, encircle the pharyngeal lumen. In non-dauers, these muscles contract in a coordinated fashion between 150-250 times/minute to concentrate and transport food particles to the grinder. Pharyngeal muscles contract radially, so that muscle contraction widens the central lumen. Relaxation of the pharyngeal muscles closes the lumen. The pharyngeal muscles in the dauer were previously described to remain intact with abundant myofibrils (Popham and Webster, 1978). These authors also noted the presence of lipid and glycogen droplets and “large, elliptical mitochondria with electron-dense matrices”. Glycogen was proposed to provide a readily mobilized energy source for pharyngeal muscle contraction in response to a food source. The presence of mitochondria with electron-dense matrices was noted to be similar to mitochondria found in cells under limited substrate conditions, and possibly reflected the dauer’s non-feeding status. Although these muscles are shrunken in volume compared to L2 pharynx, they appear less drastically shrunken than the neighboring marginal cells. The anterior pharyngeal muscles, pm1 and pm2, are arranged into three groups. pm1 is the anteriormost pharyngeal muscle, forming a ring emerging behind the pharyngeal epithelial cells. The pm2 muscles also form a cylinder stacked behind pm1. Both the pm1 and pm2 cylinders are formed by cytoplasmic projections from cell bodies located more posteriorly along the pharynx. The transition between the pharyngeal epithelium and pm1 is preserved in the dauer and appears roughly similar to that in non-dauers (DPhaSUPFIG 1). The pm3 muscles are wedge-shaped, fitting together into a long cylinder that forms the procorpus. 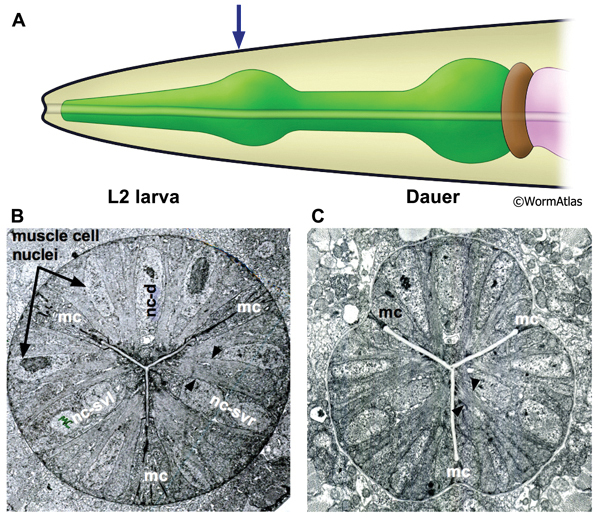 Cross-sectional EMs of the pharyngeal muscles in non-dauers reveal strips of single sarcomere muscle fibers projecting from the lumen to the basal lamina. In dauers, the strips of muscle fibers are narrow and shortened, suggesting a decrease in muscle fiber content (DPhaSUPFIG 2). The muscle cytoplasmic volume may also be reduced in dauers. The pharyngeal lumen is the central canal through which food particles are filtered away from liquid and are passed into the terminal bulb, where a structure called the grinder crushes the food before passage to the intestine. In non-dauers, the lumen of the anterior and medial procorpus appears a three-pointed shape with tubular apices (DPhaSUPFIG 2) (Albertson and Thomson, 1975). Contraction of the pharyngeal muscles widens the lumen, allowing the passage of material, while pharynx muscle relaxation closes the lumenal opening except at each tubular apex. In dauers, the lumen of the medial procorpus is often closed, possibly indicating constitutive pharyngeal muscle relaxation in this region. Along with closure of the pharyngeal lumen in some dauers, the tubular apices are often closed (DPhaSUPFIG 2F). In the metacorpus and isthmus regions of the pharynx, the lumen is generally closed in both dauers and non-dauers (DPhaFIG 5&6B). The first pharyngeal bulb, also named the metacorpus, is formed by the pm4 muscles (DPhaFIG 5, DPhaSUPFIG 3). The lateral borders between the muscle and marginal cells are reinforced by adherens junctions. 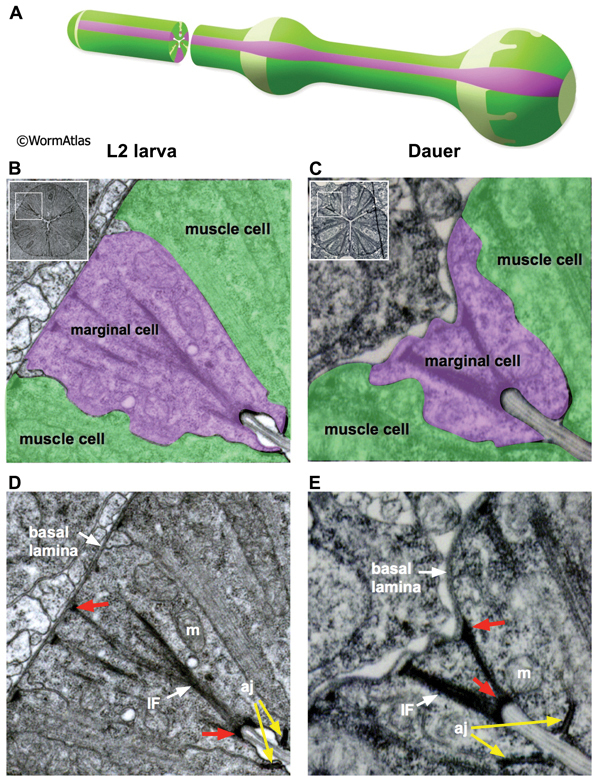 Hemi-desmosomes anchor muscle fibers to the apical and basal membranes of each muscle cell. Shrinkage of the metacorpus is observed in dauers. Shrinkage appears to affect both the marginal cells and the muscles. The degree of shrinkage may affect the overall pharynx shape and appears to be somewhat variable between individual dauers. The isthmus is a narrowed region of the pharynx bridging the metacorpus and the terminal bulb. Three wedge-shaped pm5 muscles are arranged cylindrically around the central lumen to create the isthmus. Marginal cells join the pm5 cells at the apical margins. In non-dauers, the cylindrical isthmus appears circular in cross-section. In dauers, shrinkage of the marginal cells gives the isthmus a triangulated shape in cross-section (DPhaFIG 6). Despite the shrunken appearance of the isthmus, muscle fibers within the pm5 cells are still visible, but appear to be shortened. Individual bundles of actomyosin include fewer filaments. DPhaFIG 6: Isthmus region of dauer pharynx. A. Illustration of pharynx with arrow indicating location of TEM sections. B. Transverse TEM section of pharynx in L2 larva in the region of the somatic nerve ring. (Image source: N2 L2 28-14 [D. Riddle] 1089.) C. Transverse TEM section of dauer larva in the region of the somatic nerve ring. (Image source: N2 starved dauer 50-2-2 [D. Riddle] 804.) Gland cell ducts are present in each pharynx region (d). Images are not presented at the same scale, and were differentially magnified to show structural features. The C. elegans pharynx contains three types of marginal cells, named mc1-3. Each set of 3 marginal cells is situated at the apices of the muscle segments running along the length of the pharynx (See Pharynx section). In dauers, the marginal cells display variable morphology through the pharyngeal regions. In the procorpus and isthmus regions, the marginal cells are highly shrunken, giving the dauer pharynx a pinched appearance (DPhaFIG 7 and DPhaSUPFIG 4). In the metacorpus, each marginal cell must expand locally in size to accommodate the cell nucleus. The dauer marginal cells within the procorpus contain dense intermediate filaments (IF) bridging their apical and basal membranes. Studies of marginal cell structure in IF protein mutants may help to determine whether the IFs provide structural support to the dauer marginal cells (Karabinos et al., 2003). In contrast, IFs are relatively scarce in the isthmus (DPhaSUPFIG 4). Dauer marginal cells contain very thick adherens junctions in most pharynx regions. Mitochondria are abundant in the dauer marginal cells. DPhaFIG 7: Marginal cells of the procorpus. A. Illustration showing arrangement of marginal cells and muscle cells in the pharynx. (Image source: WormAtlas PhaFIG 7A.) B&D. Transverse TEM sections of marginal cells in an L2 larva. B. Shading indicates different cell types. Muscle, green; marginal cells, purple. Inset indicates location of enlarged region within the intact pharynx. D. Same image as in B, except without shading to show cellular details. (Image source: N2 L2 28-14 [D. Riddle] 436.) C&E. Transverse TEM section of marginal cells in a dauer pharynx. C. Shading as in panel B. E. Same image as shown in panel C, without shading to show cellular details. (Image source: N2 starved dauer 50-6-2 [D. Riddle] 38M.) D&E. 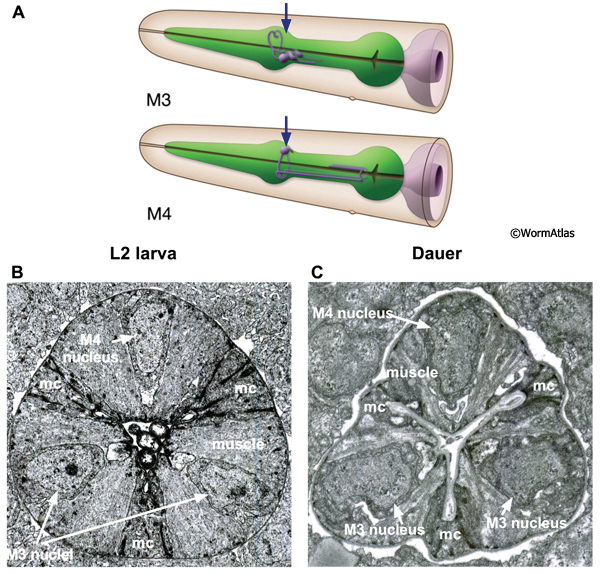 Dauer marginal cells may contain thick intermediate filaments (IF) which are anchored by hemi-desmosomes (red arrows) between the apical membrane at the lumen and the basal lamina bordering the pseudocoelomic cavity. Mitochondria are visible in marginal cells of dauer and non-dauer larvae (m). 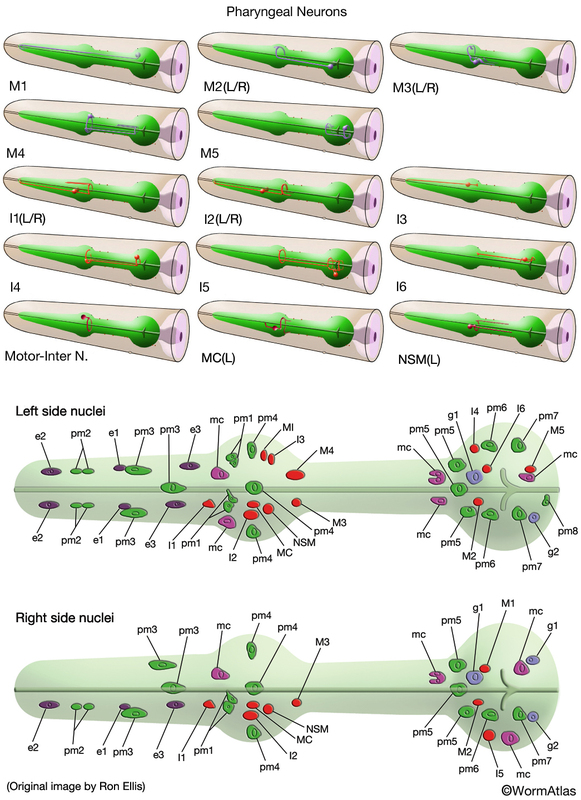 At the apical membrane, the marginal cells are attached to neighboring muscle cells by adherens junctions (aj) linking them firmly to the pm muscles. The pharynx contains two classes of gland cells, named g1 and g2. The gland cell bodies are located within the terminal bulb (PhaFIG 8A-G, PhaFIG 8H, PhaMOVIE 1). The g1 cell bodies contain numerous lamellar structures while the g2 gland cell bodies are clear and may contain vesicles. All five gland cells extend processes anteriorly into the isthmus along the dorsal and two subventral nerve cords. Thus, the three pharyngeal “nerve cords” encompass both neuronal and non-neuronal cells, without intervening basement membranes to separate the different cell types from one another. The processes of the subventral g1 glands and the g2 glands travel within the left and right subventral nerve cords to the metacorpus. In contrast, the dorsal g1 gland process follows the dorsal nerve cord and terminates in the procorpus. The gland cell processes open into the pharyngeal lumen at cuticle-lined ducts. The duct for the dorsal g1 is located in the anterior pharynx, posterior to the buccal cavity. The ducts for the left and right ventral g1 cells and for both g2 cells are situated to the posterior of the metacorpus. In dauers, the g1 ducts, process and cell bodies are identifiable at the same positions as in non-dauers. The cuticle-lined gland cell ducts are still detectable in dauers. The most noticeable change is that the cross-sectional cytoplasmic volume of the g1 gland processes appears somewhat shrunken in dauers, possibly indicating a reduction in flow through these structures (DPhaFIG 8, DPhaSUPFIG 5 and DPhaSUPFIG 6). Shrinkage of the g1 gland processes was also observed in wildtype starvation-induced dauers as compared with daf-9(e1406) mutants, which form incomplete dauers without pharyngeal remodeling (Albert and Riddle, 1988). 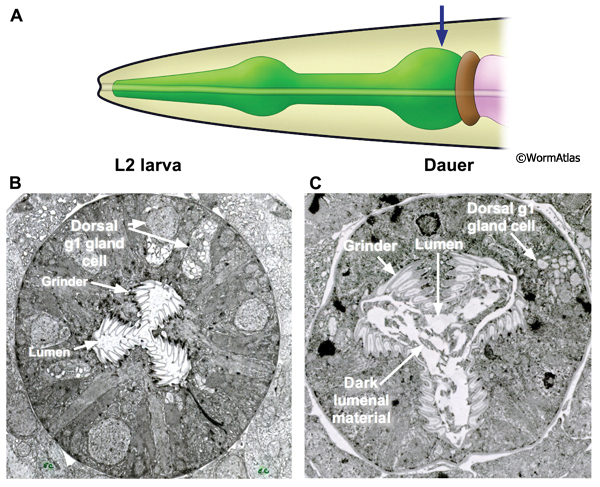 Similarly, the cytoplasmic lamellar bodies in the dorsal g1 gland cell body of a dauer larva appear collapsed in comparison to the same structures in non-dauers (DPhaFIG 9). The function of these glands may be to aid either in digestion or molting, by providing enzymes packaged into vesicles to the pharyngeal lumen (Alberston and Thomson 1975). Secretion of g1 gland cell contents has been observed during feeding and molting in non-dauer larvae (Singh and Sulston, 1978; Sulston et al., 1983; Hall and Hedgecock, 1991). In non-dauer larvae, dark-staining granules appear in the g1 gland cells prior to the molt, which are thought to assist in the molting process (Singh and Sulston, 1978). Such granules were not observed in g1 glands of wildtype or daf-9mutant dauers (Albert and Riddle, 1988). 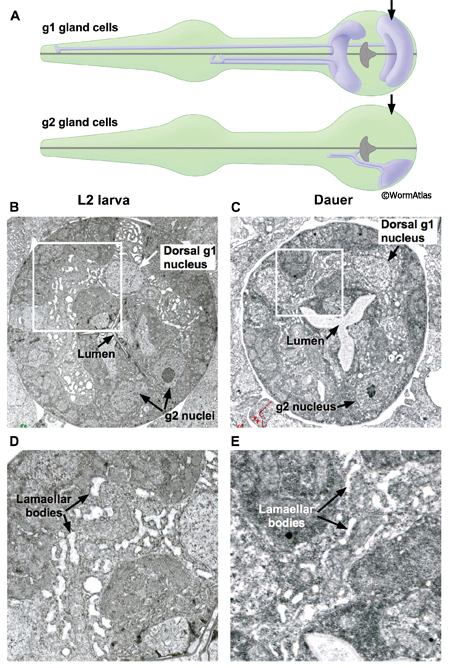 DPhaFIG 9: G1 and g2 gland cells in dauers. A. Illustrations show the g1 and g2 gland cells in the pharynx. Approximate positions of TEM sections are indicated by arrows. B. Transverse TEM section of L2 pharynx terminal bulb showing the dorsal g1 and g2 cells. White box outlines the region enlarged in D. (Image source: N2 L2 28-14 [D. Riddle] 1502.) C. Transverse TEM section of dauer pharynx terminal bulb. White box outlines the region enlarged in E. (Image source: N2 daf-4(m63) dauer [D. Riddle] 227.) B&C. Arrows indicate nuclei of dorsal g1 and g2 cells. The extent of the dorsal g1 gland cytoplasm is easily seen by the swollen lamellae inside, while the g2 gland cytoplasm lacks such swollen lamellae. The extent of g1 lamellar swelling is much reduced in the dauer. The nervous system of the pharynx consists of motor neurons, interneurons and polymodal neurons with mixed functions. The cell bodies of the neurons are located in two regions. Some cell bodies are located medially in the pharynx, within the posterior third of the procorpus and metacorpus. Other neurons have cell bodies located in the terminal bulb. The processes of the pharyngeal neurons primarily extend through the isthmus or the procorpus and are contained within one dorsal and two subventral nerve cords. In addition, the processes of some pharyngeal neurons decussate within the metacorpus to form the pharynx nerve ring. 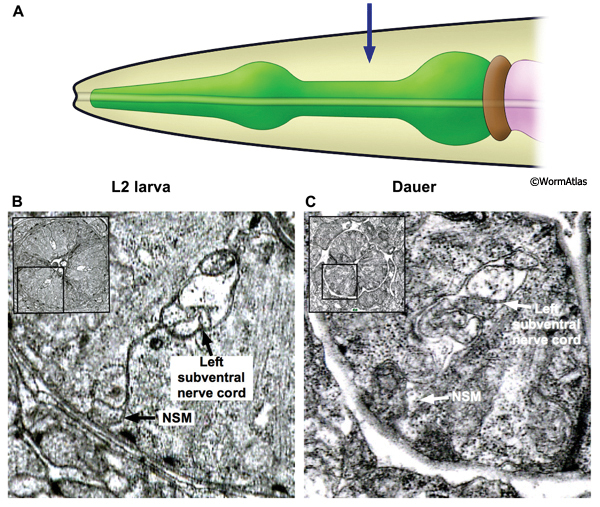 In the dauer, the overall structure of the pharyngeal nervous system is maintained intact. Neuronal processes are approximately correctly positioned (DPhaFIG 10 and DPhaSUPFIG 7). The dauer pharyngeal neurons are not as shrunken as the pharyngeal epithelium and marginal cells (DPhaSUPFIG 8). The structure and function of pharyngeal neurons in the dauer have not been fully characterized and many aspects remain open to investigation. 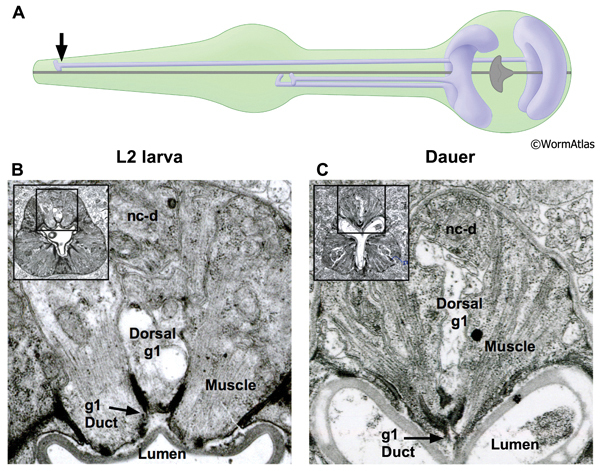 The terminal bulb (aka the posterior bulb, or 2nd bulb) of the pharynx contains about a dozen cell bodies of specialized muscles, neurons, gland cells and marginal cells (See PhaFIG 1). The terminal bulb directly abuts the six cells of the pharyngeal valve, which firmly links the pharynx to the intestine. During formation of the dauer larva, most tissues in the terminal bulb undergo substantial shrinkage in concert with the slimming of the rest of the pharynx. Only the pharyngeal neuron cell bodies seem to resist shrinkage. Three types of pharyngeal muscles lie within the terminal bulb, pm6, pm7 and pm8. The apical sides of the pm6 and pm7 muscles extend specialized tooth-like ridges that meet at the lumen to form the grinder (DPhaFIG 11). Radial muscle filaments inside pm6 and pm7 are fastened to these teeth, which are covered by a thickened cuticle secreted by pm6 and pm7. The pm8 muscle is a single cell that may squeeze the pharyngeal valve, possibly to control its lumenal diameter. The grinder in the terminal bulb is a cuticular structure which macerates the animal’s food. The grinder may also act as a gate preventing backflow of pharyngeal or intestinal contents. The grinder in the dauer looks much like that in the L2 with two notable features (DPhaFIG 11). First, the dauer grinder occupies a larger proportion of the overall terminal bulb due to shrinkage of the terminal bulb’s cellular structures. Second, the lumen of dauer specimens often contains a dark-stained material not seen in the pharyngeal lumens of L2 larvae. The dark lumenal material may reflect incomplete shedding of the L2d pharyngeal cuticle. During molting, the pharyngeal cuticle is removed by digestion through the alimentary tract. 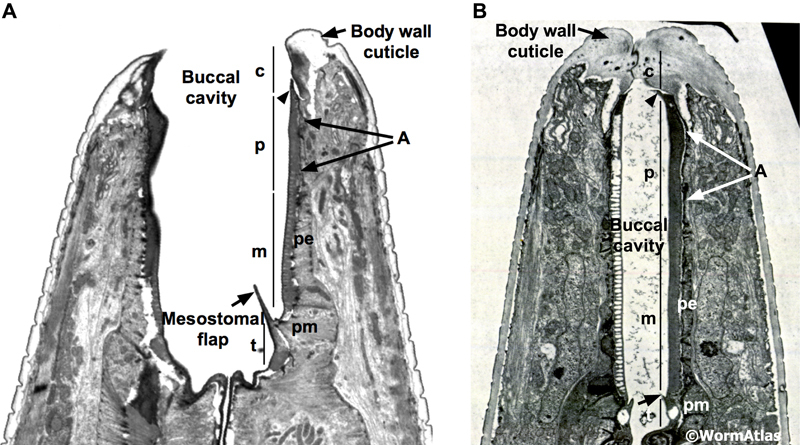 Since dauers do not pump the pharynx, this mechanism for eliminating the molted pharyngeal cuticle could be impaired. DPhaFIG 11: The terminal bulb and grinder. A. Illustration of the head and pharynx with region of TEM section designated by an arrow. B. Transverse TEM section of an L2 larva showing the pharyngeal terminal bulb. The locations of the grinder, pharyngeal lumen and dorsal g1 gland cell body are indicated. (Image source: N2 L2 28-14 [D. Riddle] 1422.) C. Transverse TEM section of a dauer larva showing the pharynx terminal bulb. The positions of the grinder, pharyngeal lumen and dorsal g1 gland cell are indicated. (Image source: N2 starved dauer 50-2-1 [D. Riddle] 973.) The overall structures of the terminal bulb and grinder are preserved in dauers. The grinder appears to occupy a larger relative portion of the terminal bulb area in the dauer, probably reflecting that the extracellular cuticle of the grinder teeth is virtually unchanged, while most of the terminal bulb's cells have shrunken dramatically. The L2 and dauer images are not to the same scale. In dauers, the pharyngeal lumen contains dark material which may be unabsorbed L2 cuticle. DPhaSUPFIG 1: Anterior pharynx region. A&C. Anterior pharyngeal region of reproductively-developing animals. B&D. Anterior pharyngeal region of larvae arrested in dauer. A. Anterior pharynx of an adult (horizontal TEM section). (Image source: N533 [D. Hall] J2 F300.) Inset, illustration of anterior pharynx muscles, showing the stacked-cylinder arrangement of pm1, pm2 and pm3. Only two pm3 cells are shown; the third pm3 cell is behind the lumen out of the plane of view. The lumen is depicted as a central cylinder. When the pharynx muscles are relaxed, the lumen is closed. B. Horizontal TEM section of anterior pharynx in a dauer. (Image source: Starved N2 dauer 50-7-1 [D. Riddle] 34.) C. Anterior pharynx of an L2 (transverse TEM section). (Image source: N2 L2 28-14 [D. Riddle] 144.) D. Anterior pharynx of a dauer (transverse TEM section). (Image source: Starved N2 dauer 50-2-2 [D. Riddle] 225.) Karets indicate hemi-desmosomes anchoring pm1 muscle fibers to the basal lamina. Cytoplasmic intermediate filaments (IF) can be detected in the pharyngeal epithelial cell cytoplasm adjacent to the pm1 cells. The lumen of the nondauer animals contain ingested bacterial cells as evidence of feeding. DPhaSUPFIG 3: Posterior metacorpus region of dauer pharynx. A. Illustration of pharynx with arrow to indicate location of TEM sections. B. Transverse TEM section of posterior metacorpus in an L2 larva. (Image source: N2 L2 28-14 [D. Riddle] 801.) C. Transverse TEM section of posterior metacorpus of a dauer pharynx. (Image source: N2 starved dauer 50-2-2 [D. Riddle] 556M.) B&C. 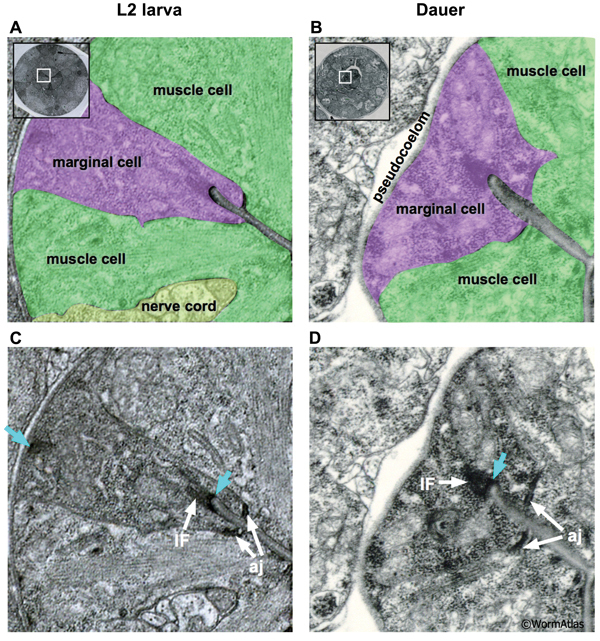 Shading indicates cell types: green, muscle; purple, marginal cells; yellow, nerve cords containing neuronal and gland cells. Markings in B indicate M3 and M4 neuron cell bodies of three pharyngeal neurons in the metacorpus. Images are not presented at the same scale, and were differentially magnified to show structural features. DPhaSUPFIG 6: Ventral g1 gland ducts and processes. 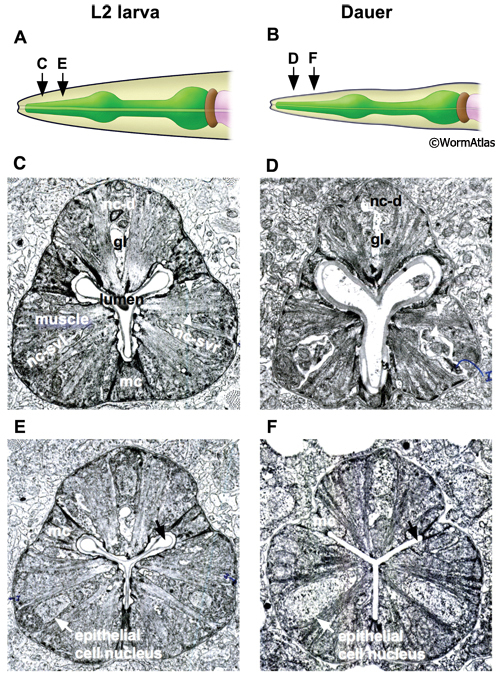 A. Illustrations showing positions of dorsal and ventral g1 gland cell bodies and processes. The gland processes travel anteriorly within the three pharyngeal nerve cords. The pharyngeal nerve cords contain neuronal and non-neuronal cell types in close apposition without intervening basement membranes. Arrow indicates approximate position of TEM sections in B&C. B. Transverse TEM section of L2 larva showing ventral g1 gland processes and ducts within the left and right subventral nerve cords. (Image source: N2 L2 28-14 [D. Riddle] 836.) C. Transverse TEM section of dauer showing ventral g1 gland processes within the left and right subventral nerve cords. Gland process diameters are shrunken in the dauer compared to L2. (Image source: N2 starved dauer 50-2-1 [D. Riddle] 350M.) Abbreviations: nc-d, dorsal nerve cord; nc-svl, left subventral nerve cord; nc-svr, right subventral nerve cord. DPhaSUPFIG 7: Neuron processes in the isthmus. A. 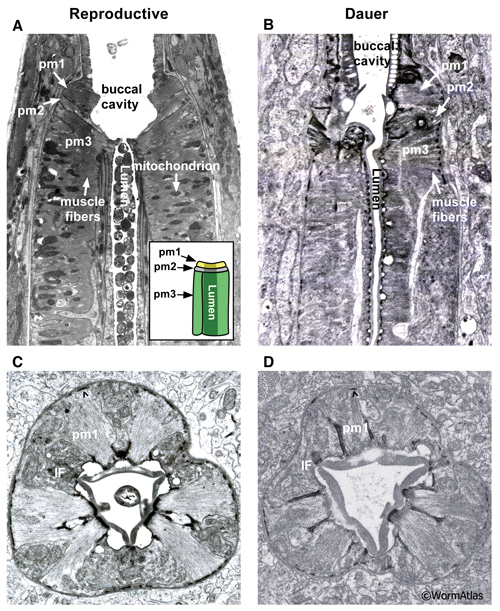 Illustration showing the head and pharynx with region of TEM sections designated by an arrow. B. Transverse TEM section in the isthmus of an L2 showing the left subventral nerve cord containing neuron processes and a gland cell process. The NSM process at the basal membrane of the pharynx is indicated. (Image source: N2 L2 28-14 [D. Riddle] 1035.) C. Transverse TEM section of a dauer pharynx in the isthmus region, also showing the left subventral nerve cord and an NSM process. (Image source: N2 starved dauer 50-2-2 [D. Riddle] 787.) In B&C, NSM processes in basal positions form active zones pointing towards the pseudocoelom (see also PhaFIG 9F-H to see example of these zones in the adult). This anatomical feature led to the hypothesis that NSM neurons have neurohumoral roles and may influence other cells at a distance (Avery and Thomas, 1997). One such example is the role of NSM serotonerigic neurotransmission in the enhanced slowing response of food-deprived animals upon encountering a food source (Sawin et a.l, 2000). DPhaSUPFIG 8: Neuronal cell bodies in the dauer pharynx. A. Illustrations showing the positions of the pharyngeal neurons M3 and M4. The nuclei of the M3 cell pair are located in the left and right subventral nerve cords. The M4 cell nucleus is located in the dorsal nerve cord. Arrows indicate the location of TEM sections below. (Image source: R. Ellis/WormAtlas Pharyngeal neurons.) B. Transverse TEM of pharynx in an L2 showing the M3 and M4 nuclei and cell bodies. (Image source: N2 L2 28-14 [D. Riddle] 834.) C. Transverse TEM of dauer pharynx showing the M3 and M4 nuclei and cell bodies. (Image source: N2 starved dauer 50-2-1 [D. Riddle] 346M.) One region of pharyngeal muscle is indicated (muscle); mc, marginal cell. 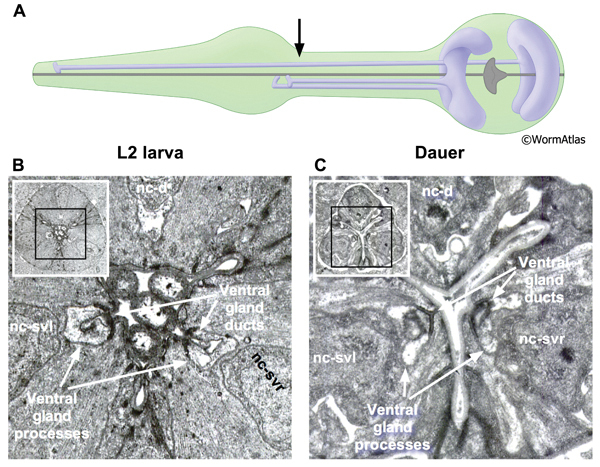 The overall shape and size of the pharyngeal neuron cell bodies is preserved in the dauer, although the cytoplasmic membrane may be rougher and less smooth than in the L2. The neuron cell bodies have changed in size only modestly, if at all, while surrounding pharyngeal muscles and marginal cells have shrunken dramatically in the dauer. Mango, S.E. 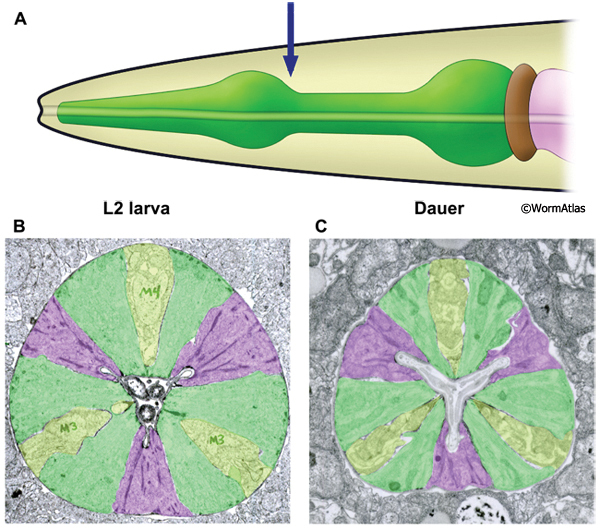 The C. elegans pharynx: a model for organogenesis (January 22, 2007), WormBook, ed. The C. elegans Research Community, WormBook, doi/10.1895/wormbook.1.129.1. We thank Patrick Hu and Birgit Gerisch for comments and suggestions.